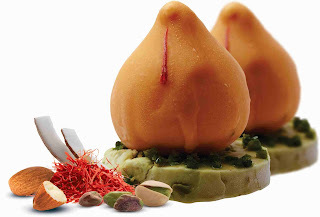 STARFRIDAY : Enjoy spirit and joy of Ganesh Chaturthi with Aaji’s Modak Ice Cream! Enjoy spirit and joy of Ganesh Chaturthi with Aaji’s Modak Ice Cream! Mumbai,22 August, 2017:In an attempt to woo Modak lovers, Havmor Ice Cream, a leading pure milk ice cream brand has come-up with Modak Ice Cream this year, too. This unique offering is exclusively available in select Havmor ice cream outlets across Maharashtra & Goa. Last year Modak Ice Cream received overwhelming response. It is a perfect dessert for modak lovers, especially the health conscious minds. It is a concoction of churns of dried coconut shreds, almonds & pistachio nuts. With every layer of ice cream, one will experience a real taste of Modak. The new exotic variant ice cream, designed for Modak lovers,is available in the form of Modak, starting from INR 70/- per unit. This flavor is available till stocks last, so visit the nearest outlet and enjoy the modak melting in the mouth, with its delightful flavor.